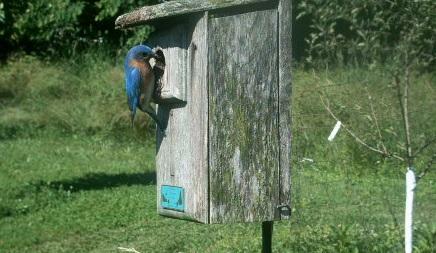 Choosing the right birdhouse is important in attracting the birds you want to invite to your yard. A good birdhouse will have the correct hole size for the bird's size. The house will also have adequate ventilation and drainage. Most importantly a birdhouse should be easy to open. This allows for monitoring and cleaning. The following birds will use a nest box. Wren, Chickadee, Titmouse, Nuthatch, Downy Woodpecker, Red-Bellied Woodpecker, Northern Flicker, Bluebird, and Tree Swallow. Undesirable and non-native birds such as the European Starling and House Sparrow should be discouraged from building a nest whenever possible. Purple Martins nest in a colony fashion and use a gourds or apartment style housing. Be wary pruning trees or bushes as bird nests may be located within.